We've visited Disney World in Florida more times than I can count. After so many years of driving to Florida and visiting every theme park in Orlando, it was time for a change. Our bags and passports were ready to travel abroad. We knew we wanted to go on cruise and we knew we wanted it to be on a Disney ship. After years of wonderful Disney experiences we felt loyalty to the brand and comfortable with their level of family entertainment. We began our research online and started laying out our plan. The first questions we answered were "Where and when are we going?". Traveling with my my wife and two daughters, we wanted to make sure we had as much available without spending a small fortune. We decided on a four night Bahamian voyage from Cape Canaveral, Florida to the Bahamas. We decided to sail the second week of January to save on Disney's off-season prices. The itinerary included a stop at Nassau, Castaway Cay (Disney's private island in the Bahamas) and a full day at sea. We drove from New York to Jacksonville on Saturday, Jan. 19th 2013. This 14 hour drive has become a yearly ritual for us, so it was just an ordinary occurrence. We departed Jacksonville at 9:00am the following morning in order to arrive at Cape Canaveral in time for our 1:30pm boarding hour. Cape Canaveral is incredibly easy to get to from I-95. We followed the signs to terminal B and before 1:00pm, we were already dropping off our bags and parking our vehicles. Disney's terminal at Cape Canaveral offers on-site parking at $15 per night rates. Higher rates apply for premium parking. I've read many reviews of families saving about $30 by parking off-site at private parking lots or hotels. Although this may seem like a bargain, I suggest parking at the terminal simply for the convenience. The parking lot is directly connected to the terminal via catwalk. This makes disembarking a breeze, too. Once you round up your bags, all you do is walk across the street and get in your car. No need to wait for any further transportation or taxi's. Check-in at the terminal was incredibly fast and easy. Be sure all occupants of your stateroom are together. You will need to sign some paperwork and take a picture that will be used for identification when boarding or disembarking. The entire check-in process, a few pictures, and waiting for our boarding number to be called took roughly twenty minutes. Once we walked into the gangway, we took some more pictures, then entered the ships atrium. The Disney Dream's atrium is a huge, rectangular, three-level gathering area adorned with an art-deco glass chandelier, marble steps, a grand piano, and a statue of Admiral Donald Duck. Once onboard, we hardly had a chance to take in the sights before we offered two dining options: option 1 would send us to deck 11 aft for a buffet lunch at Cabanas while option 2 led us down one level to the Enchanted Garden lunch buffet. We chose the Enchanted Garden. The buffet offered many seafood selections like shrimp and crab legs as well as a carving station, cold cuts, vegetables, salad, and grilled lamb chops. Immediately after lunch, we headed to our stateroom. Our family had chosen a category 4A family verandah room on level 9. Once we entered the room, the first thing we did was figure out the lights. We had to insert a room key at all times in order to turn the power on in the room. Once we figured that out, we explored the balcony. Once we pulled the curtain and opened the sliding glass door, we knew this was the place we'd spend most of cabin time. The balcony added approximately 30 square feet of outdoor real estate. The glass wall offered unobstructed views of ocean while sitting or standing. The balcony had two chairs and a small coffee table that served as our breakfast table every morning. Once we were acquainted with the room, it was time to head to our station for the mandatory drill. Once the drill was over, we headed to the pool deck for the sail away party. The kids liked the dancing Disney characters and the streamers flying everywhere. Definitely a good time if you have kids. Shortly after the party started, the ship pulled away from the terminal, sailed slowly down the jetty and into open ocean. We watched our first sunset from the deck 12 sports area. Our cruise was finally underway! That evening we dined at Animator's Palate. The Disney Cruise Line offers a rotational dining assignment which guarantees at least one meal will be served at each of their three main restaurants. Animator's Palate is an homage to the artwork of Disney. It also features giant screens depicting characters from Pixar's Finding Nemo. Our table was directly next to one of the screens. Before we knew it, we were being interviewed by Crush, the sea turtle. The girls really got a laugh when Crush called my glasses "sea goggles". Our evening ended with chocolates and folded towel swan waiting for us in our room. It was a great way to finish off a very busy day. We woke up the next morning at 8am knowing that room service will soon deliver our morning order of the day. The coffee, donuts, cookies, hot tea, juice and milk were delivered right on time! We poured our drinks, grabbed our snack and headed right for the balcony. Once outside, in the horizon, we could see some pilot boats approaching and land mass growing behind them. We were slowly approaching Nassau. Once we pulled into Prince Georges Wharf, the ship performed a 180 degree turn in the basin and backed into the port. Directly opposite of our ship was the Royal Caribbean Allure of the Seas (an Oasis-class ship - the biggest passenger cruise ship in the world). Directly behind this mammoth ship we could see the towers of Atlantis. Atlantis is located on Paradise Island just north of Nassau. This resort island would be our destination for the day. We booked a tour of the Atlantis Resort through the cruise line. The $59 excursion granted us transportation to and from the terminal, a guided tour of the hotel, and full access to the aquarium and the predators lagoon. We gathered on the ship at D-Lounge to get our wrist bands, hand in our release forms and wait to be escorted to the buses. Once 11am rolled around, our excursion group disembarked the ship and walked about 5 minutes to the bus. The bus, which seated 20 passengers, was perfectly clean, air-conditioned, and proper working order. The bus driver also served as our tour guide of downtown Nassau. The drive took us through the government district as well as famous hotels and landmarks. Once we reached Atlantis, we were greeted by our hotel tour guide. He first walked us through the stores and fashion boutiques in the hotels lobby. It's very reminiscent of a Las Vegas-style hotel. We then walked across the hotel casino and main lobby. The tour then proceeded to the underground ruins area called "The Dig". It's suppose to mimic an archeological dig of Atlantis' ruins. The main attraction here is the giant aquarium filled with tropical fish and huge manta rays. Afterwards we toured the main pool grounds of the resort which offered great views of the famous hotel towers. A bit more walking led us to the Predators Lagoon. Here you will walk through an underwater tube surrounded by sand sharks, sting rays, barracuda, and colorful tropical fish. Once the tour ended, we were free to explore any of the grounds we had previously visited including the casino. Around 4pm, we boarded our bus and headed back to downtown Nassau. Downtown Nassau is full of souvenir shops, retail, and jewelry stores catering to the cruising tourists. The area is very popular and can seem very crowded at times. Despite the crowd, we always felt safe walking around and wish we had more time to explore the area. We did manage to stop by the local Tortuga Rum store for some excellent rum cake! Once we headed back to the terminal, we walked directly to the immigration office for a passport stamp. The attendant stamped all our passports in no time and with no questions asked. Afterwards, we went through the security check-in and boarded the ship. Our second evening featured a dinner at the Enchanted Garden. The a la carte menu featured seafood options but also chicken and pork entree's. If you're a picky eater you can always order from the kids menu which includes more familiar selections such as burgers, hot dogs, pizza, pasta, and chicken fingers. Every meal also includes an appetizer and dessert. Our evening ended once again with chocolates and a folded towel puppy wishing us a good night. The third day started with a knock on our door as room service was being delivered Our morning coffee and tea led us once again to the balcony and beautiful view of Castaway Cay! The parasailing and glass-bottom boats were sailing by as we walked out. We could also see the workers on the shore prepping the jet-ski and boat rental areas. The line of cabanas and colorful buildings served as a backdrop to the sparkling blue waters of the Cay. We only had one thing in mind: let's hit the beach! Once we left the ship we were greeted by Lilo and Stitch posing for pictures. We also took some pictures of the Dream before boarding the tram car to the beach. Once we reached the beach we picked up three floating tubes, changed into our bathing suits, and hit the water. The beach was gorgeous and offered picture-perfect views of the Disney Dream. This was mid-January so the water was about 70 degrees. It wasn't ideal swimming temperatures but the sun was hot enough to keep us warm. Around 1pm we decided to eat at the nearby restaurant, Cookies II, an outdoor grill-style eatery. Cookies II served up burgers, hot dogs, ribs, chicken, as well as a variety of salads and sides. Endless drinks and an ice cream are also available. Dining at these restaurants is included in the price of the cruise so no extra money is required on the island. If you wish to rent any beach equipment once there, you simply swipe your room key and the charge will added to your room. After lunch, we decided this was perfect time to head back to the ship and hit the Aqua-Duck ride. We boarded in a flash and headed straight to deck 12. There was a very short waiting line for the ride, much shorter than we had seen previously. We rode the Aqua-Duck several times before finally heading back to our stateroom. When we did arrive at our room we had pirate bandana's waiting for us on our bed. It was pirate night! Our third dinner was at the Royal Palace. It was also pirate night on the Disney Dream. The entire staff is dressed in the pirate garb and a surprisingly large amount of guests wore full pirate costumes! The menu also featured a pirate theme with selections such as Jolly Roger's salad, and Jack Sparrow braised short ribs. The evenings festivities also included the "Pirates IN the Caribbean" live-action show followed by the "Buccaneer's Blast" fireworks! 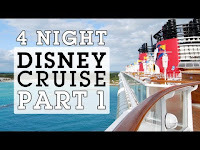 At the time, the Disney Dream was the only vessel featuring fireworks at sea. They were a real treat! We we retreated to our stateroom we were greeted by a folded towel monkey hanging from the ceiling and a handful of chocolates spread out on the bed. Our fourth day was a full day at sea. With no set plans in mind, we knew this would be our only chance to sleep in late. We also knew this would be our only chance to explore the ship. We had our room service delivered at 9am this morning. We spent a good amount of time just relaxing and enjoying the view from our verandah. We then headed out on our ship exploration campaign. Our first stop on the ship was the outdoor promenade on level 4. After walking around the promenade, we headed indoors to the shutters photo studio. After a quick review of the family pictures, we decided to buy the DVD package which includes every printed 8x10 along with a digital copy for future printings. We then headed to level 3 forward to visit the retail stores. Here we picked up all our souvenirs including Disney Cruise sweatshirts, shot glasses, and resin models of the ship. We then decided to walk the three levels of the atrium where we encountered a photo-op with none other than Captain Mickey Mouse himself! Immediately afterwards, we headed to the Walt Disney Theater to see the musical show "Believe". "Believe" is a tale of father who's so busy with his work to realize the real important things in life are not things, it's people. The show is must-see for all families and I highly recommend it. Further exploration of the ship took us around the multiple lounges and clubs in decks 4 and 5. We then headed to deck 11 aft for lunch at Cabanas buffet. After lunch we trekked across the 11th and 12th decks exploring the pool areas, sunbathing lounges and sports complex. Seeing all the fun had us rushing back to our staterooms and changing into our bathing suits for a few more rides on Aqua-Duck. My wife also had time to take in a few rounds of Bingo while we spent our time outdoors. Our last dinner on the Disney Dream was once again at the Royal Palace. The menu featured a French theme with appetizers like French Onion soup, and crème brulee desserts. Entrees included beef tenderloin, baked salmon, organic chicken breast, and others. Our final evening also featured a folded towel rabbit, some more chocolates and a customer satisfaction survey. They'll also give you a brochure for booking future sailings which includes an onboard discount of 10%. After dinner, we packed our bags and placed them outside our door for pick-up. It was our final night on the Disney Dream and our final view of the starry sky from our balcony. Our Dream vacation was coming to an end and much sooner than we'd like. Our final morning on the Disney Dream offered a sit-down breakfast at the Royal Palace. It was the final chance to exchange pleasantries and well-wishes with our dining staff. Our waiters, which had been with us throughout the entire voyage, were cordial and incredibly attentive. For those four evenings and final morning, they were part of the family. It's all part of the Disney charm that keeps everyone exclaiming how wonderful Disney destinations can be. After our breakfast, it was time to disembark. It was bitter-sweet to step off the Dream and back to the cool Florida winter weather. We rounded up our bags, walked to the parking deck, and hit the road to New York once more: an experience we hope to repeat soon!